A GMC truck is passing this knocked-out Tiger tank of SpzABt 508 in the vicinity of Rome, Italy, 1944. 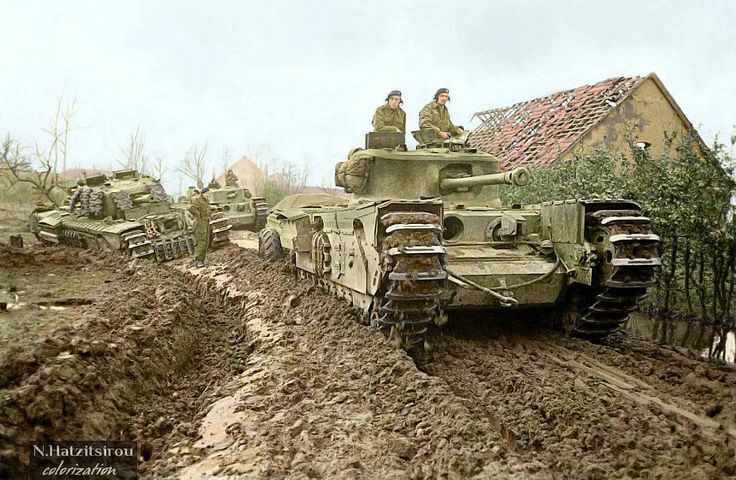 The reason so many tanks are photographed on their sides next to roads is that the Allies needed to use the roads for their own operations, so they used tractors to push the tanks off the road and into the ditch that in those days in Europe inevitably lay beside the road. This was a very popular tank for photographers, by the way, and multiple images at different times were taken of it. Due to the poor colors in this photo, I would give good odds that it is an original color photograph. Tanks are not particularly colorful. In fact, they are painted so as to blend into whatever background they are in. However, there is something about a color photograph that places a massive tank in context better than a black-and-white photograph does. A US M24 Chaffee Tank, taken in 1943. Accordingly, this is a page of World War II tanks in color. I make every effort to cull out any photos that are from post-war movie sets and the like. 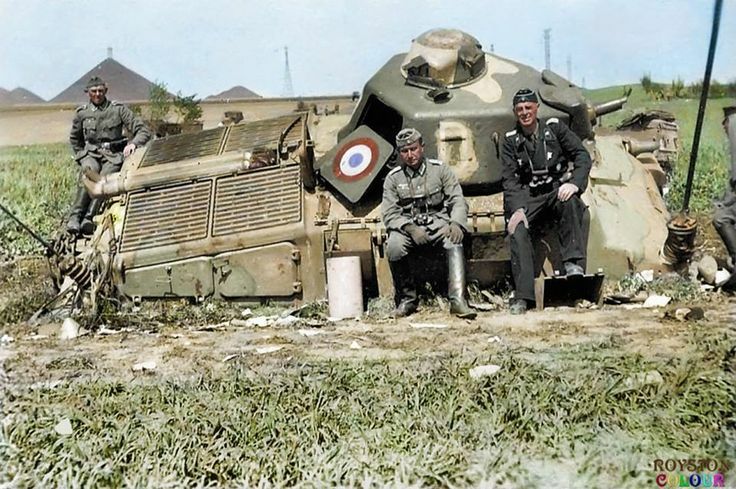 Three Germans (on the right, in black, is a Panzer commander) pose with a knocked out French AMC Somua S 35 Command tank (serial Nº 10664). This was taken somewhere on the Western Front (maybe Arras) during the invasion of France in 1940 (colorized). As far as I can determine, these are authentic photographs from the World War II time frame (I extend that liberally through the 1930s because 1930s tanks were used in the conflict, but with a definite termination point of 1945). The Soviets had very good tanks of their own, but they used western tanks (which they received for free) interchangeably with their own. Usually, each Soviet formation would have either T-34s or Sherman tanks, but they were both classified equally as simply "medium tanks. 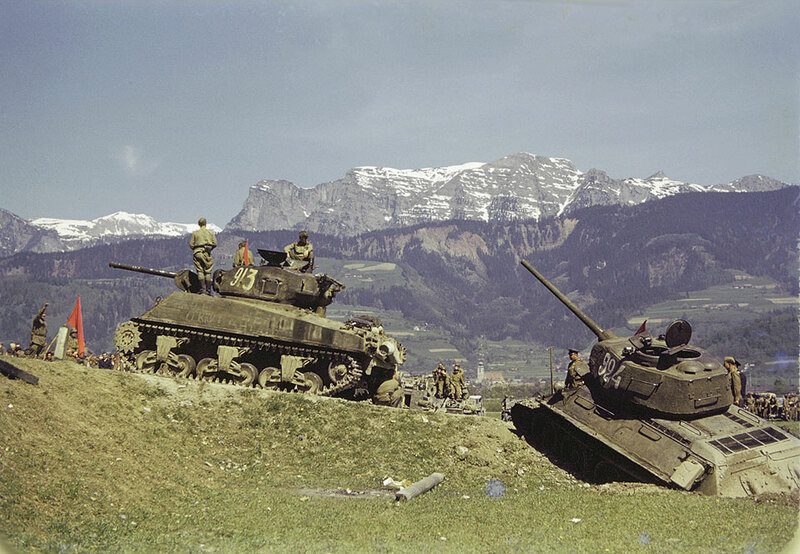 Here, the Red Army is using some near Linz, Austria when it hooked up with the US 9th Armored Division. This photo was taken by Signal Corps photographer Arnold E. Samuelson on May 2, 1945. 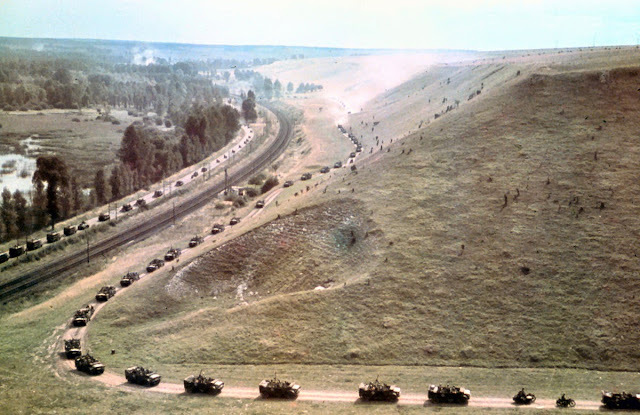 Naturally, all combatants had tanks of one sort or another. However, everybody on both sides was more interested in German tanks rather than any others. The Germans didn't think particularly highly of Allied tanks (with a few exceptions), and the Allies found German tanks to be a novelty. 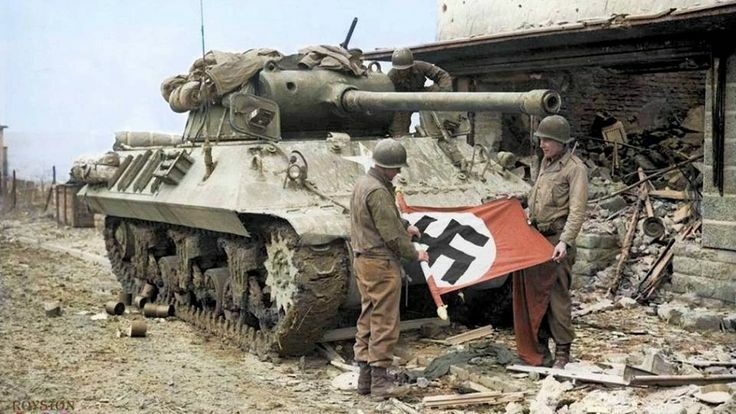 So, aside from static pictures taken at training grounds or posed pictures well behind the front and the like, there are far fewer pictures of Allied tanks than there are of Wehrmacht tanks. That preference, if anything, has been amplified during the post-war years. However, these pages are intended to show a balanced picture of the war and not just focus on one side or the other. General Rommel like to fly around in a Fieseler Storch and get a first-hand appreciation of the battlefield. Major General Rommel (later Field Marshal) also was a bit of a photographer himself - the story goes that Joeseph Goebbels personally gave Rommel a camera. This picture was taken by Rommel while flying above his 7th Panzer Division during the invasion of France in May1940. Note that the Wehrmacht at this time has no worries whatsoever about air attack, moving along brazenly on open roads in broad daylight. A lot of photos have been colorized, and I mark them as such when I am 100% certain - but any photo here could have been colorized. 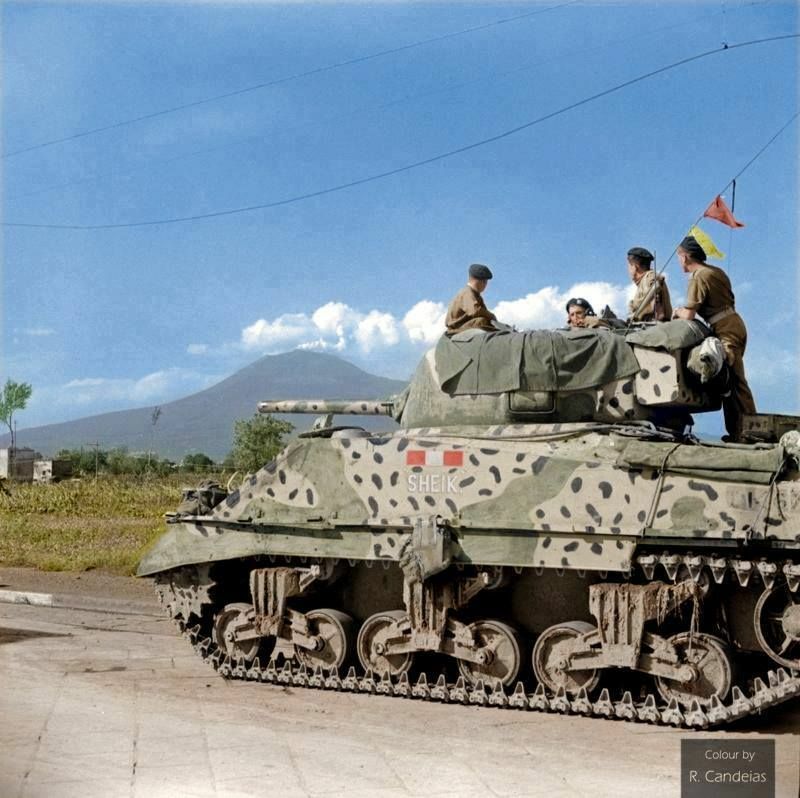 During the drive on Naples in 1944, the crew of ‘Sheik’, a Sherman Mk.III (M4A2) belonging to 'A' Squadron of the Royal Scots Greys (2nd Dragoons), watch water vapor coming out of Mount Vesuvius. I have no problem with colorization as long as the source photograph is authentic. Generally, after you have seen a lot of these pictures, you can pick out the fakes - but not always. A film set from 1962, for example, using original equipment that was still fairly common can look as authentic as the real thing. There are usually little hints as to authenticity, though. M36 90mm Tank Destroyer (90 mm Gun Motor Carriage) in Bitburg, Germany. The town was captured by the US 5th Infantry Division on February 28, 1945. The Allies designated Bitburg as a "dead city" because it was 85-percent destroyed by Allied bombing. Bitburg, of course, is the site of a major war cemetery (colorized). Another problem is that the same equipment was used by the Americans in the Korean War, but those shots usually are easy to identify. 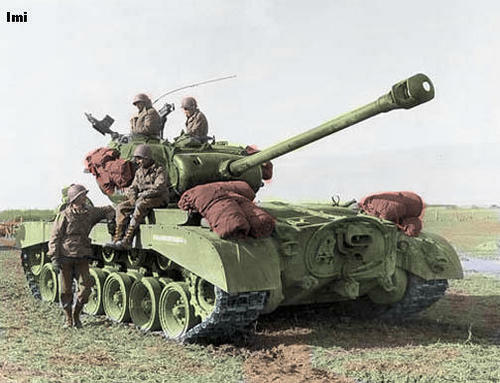 M26 Pershing heavy tank of US 9th Armored Division near Vettweiss, Germany March 1945 (colorized). 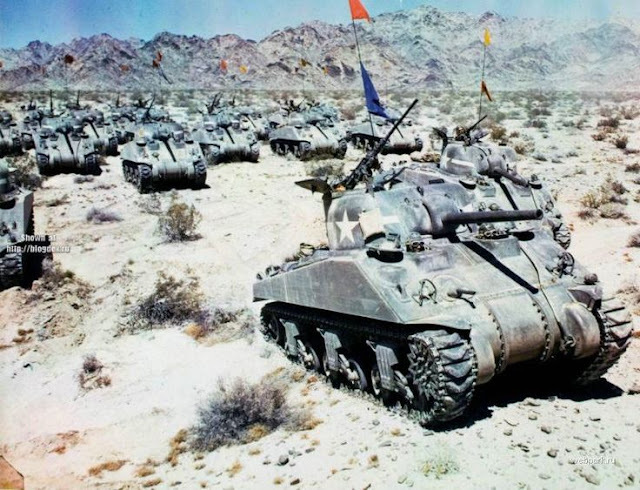 M4 Sherman Tanks during manoeuvers in the California desert. Color film was several times as expensive as black-and-white film and it couldn't be used anyway. So, most color photographs are of very highly placed individuals whose dignity required color shots such as studio portraits of generals and admirals. A few wealthy individuals, such as Eva Braun, also used color at times. Panzerkampfagen 38 (t) tanks made by Czechoslovak Skoda and German-made Panzerkampfwagen II during Operation Barbarossa. These are from Panzer-Regiment 25 / 7th Panzer Division. This was Erwin Rommel's division, also known as the Ghost Division. Rommel, however, was in North Africa when this was taken. 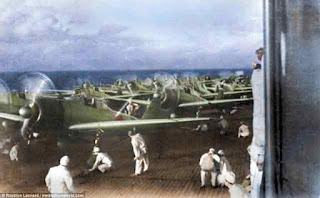 The bottom line is that you should assume that any color photo from the World War II timeframe has been colorized using some flavor of photoshop unless otherwise indicated. There are no guarantees either way, but odds are that anything that looks too good outside of an obvious portrait situation is likely to be colorized. As shown by the watermark in the lower right-hand corner, this was colorized. 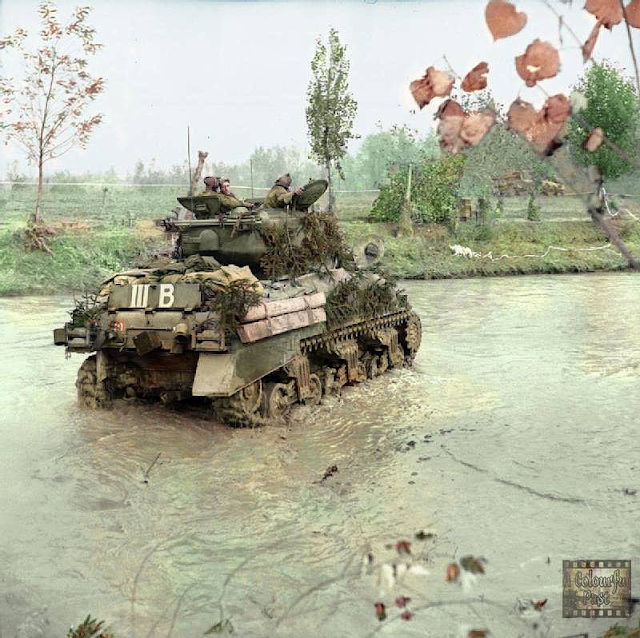 It shows a Sherman IIA (M4A1(76)W Medium Tank of the 2nd English armored brigade in Italy in 1944. As always, thank you for stopping by. If you have any pertinent comments or observations, feel free to leave them below. A column of Churchill Mk VII Crocodiles and Mk V CS tanks of the 1st Fife and Forfar Yeomanry, 31st Armoured Brigade, 79th Armoured Division in Geilenkirchen, North Rhine-Westphalia, Germany. This was during "Operation Clipper" of 10–22 November 1944. 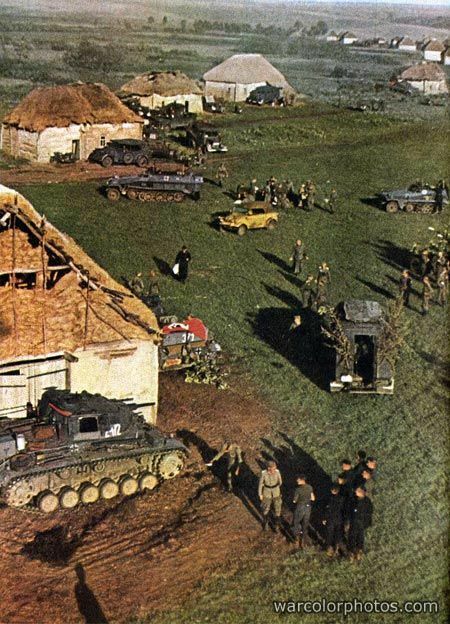 If you like these color photos, you may wish to check out my other pages of color photos of World War II. Panzerkampfwagen Panzer II from the 10th Panzer Division during the battle of Sedan, France, May 13, 1940. 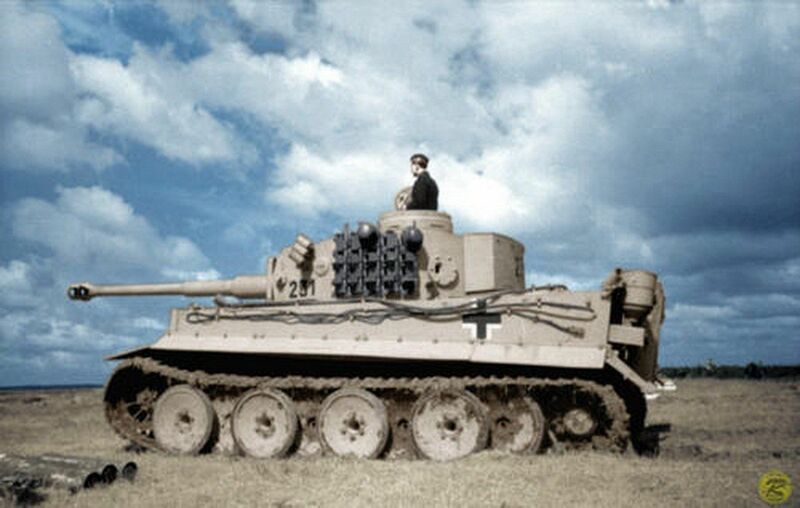 The Panzer II was one of the main Wehrmacht tanks in 1940. 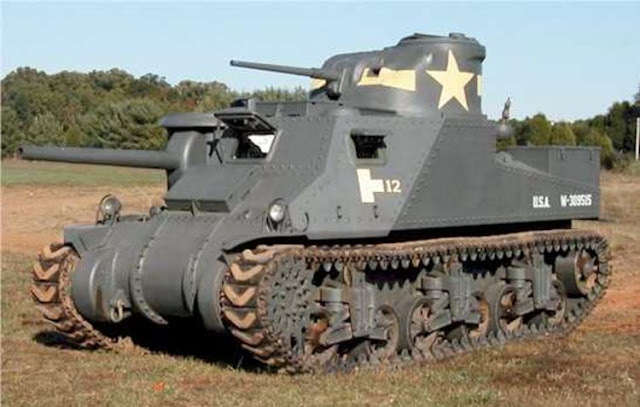 A United States M3 Lee. Lee tanks were M3 medium tanks that employed the US pattern turret, as opposed to Grants that used a British turret. 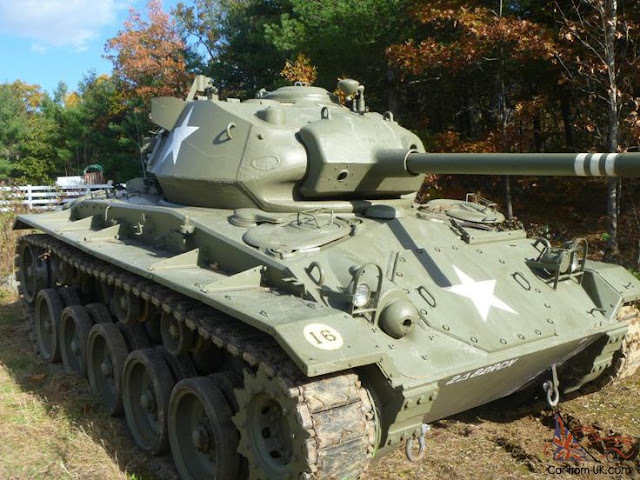 Many people consider this offset-sponsoon design to have been out-of-date the day it was introduced, but overall the tank was a huge step up from the M2. "New Zealanders take prisoner the crew of a Matilda tank, captured by the Germans and used in an attempt to break through the Allied lines, during which it was knocked out by an anti-tank gun, 3 December 1941." The Germans have placed markings on the tank to avoid friendly fire because the Luftwaffe was quite powerful at this time. 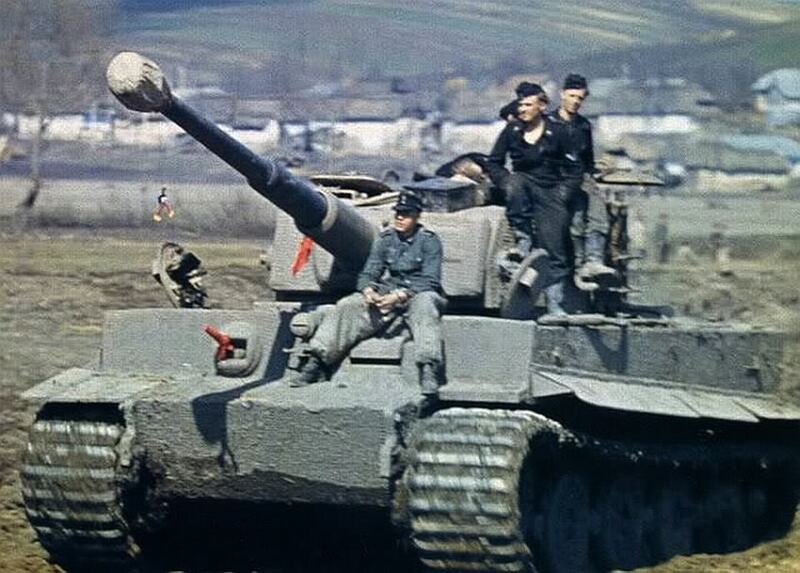 Colorized from © IWM (E 3743E). 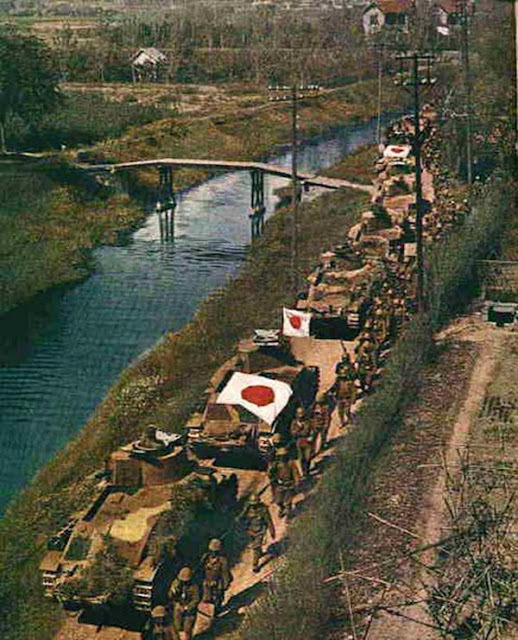 Japanese tanks (Type 89 and 95) with flags draped to prevent friendly fire. This is probably in China, but there is no certain ID on this picture that I have found. 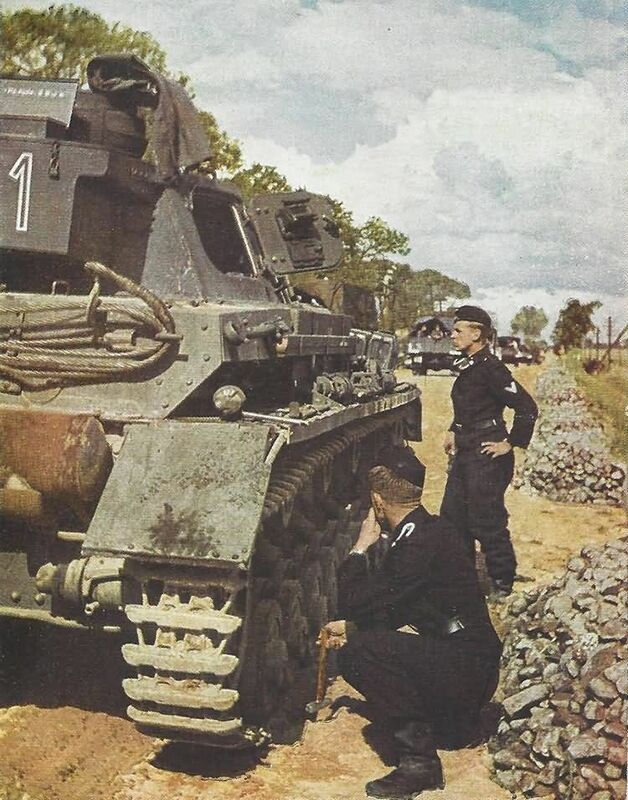 The crew of a Panzer IV, wearing the black uniform with pink piping on the collars that was standard issue to tank crews, are inspecting the tracks for wear. They also are resetting track pins as evidenced by the hammer in the hand of the crouching crewman. Note the open toolbox atop the turret stowage bin, and a tarp laying on the turret roof by the commander's cupola. 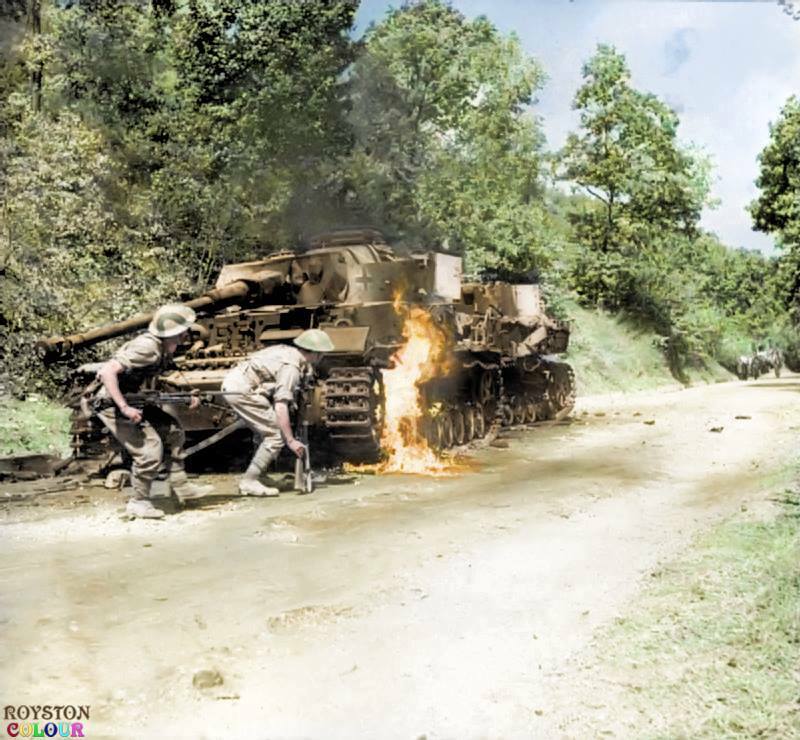 A big part of being a tank crewman was simply keeping it running because otherwise you were walking. 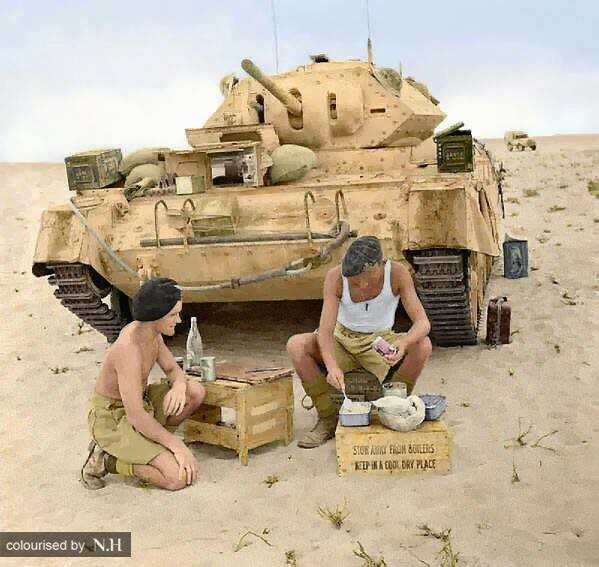 Some Tommies brewing tea by their Crusader Mk II in North Africa, 1942. A Tiger tank of Schwere Panzer Abteilung 506 in Russia, early 1943. This is a good example of where colorization shows you something you might not notice in the black-and-white original photo because here you can clearly see a doll mascot dangling from the main gun. Panzerkampfwagen VI Tiger tank #231 in northern Russia, mid-1943. The tank is straight from the factory and has not had any camouflage applied yet. This is a fairly well-known photograph in the original black and white, and someone decided to colorize it. The crew of an up-ended (M4A1) Sherman tank of the 7th Armoured Brigade has some tea beside their vehicle while waiting for a recovery team. 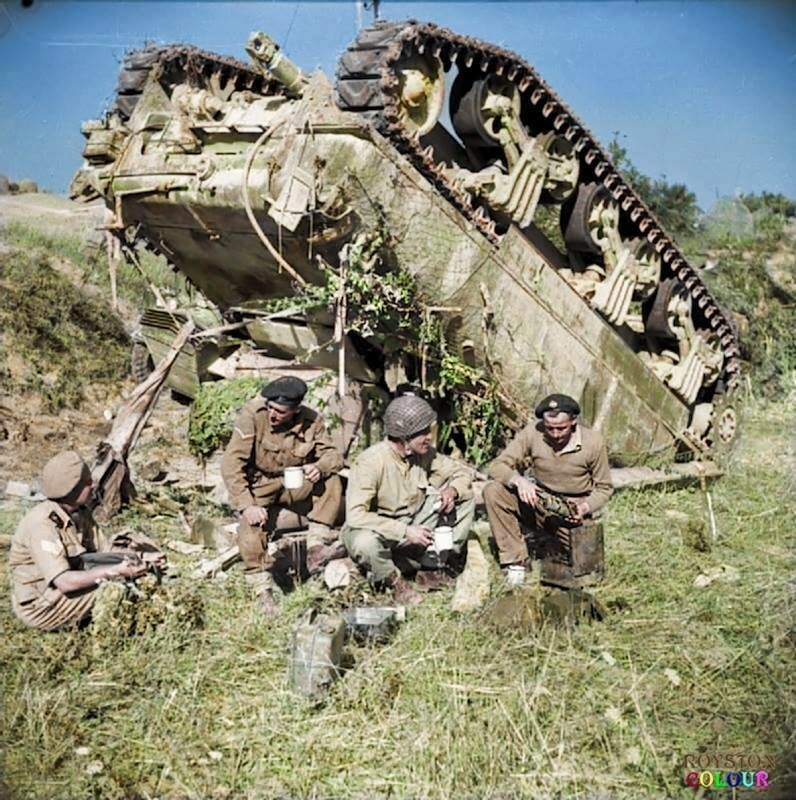 This was during the early battles on the "Gothic Line" in Italy, 13th of September 1944. 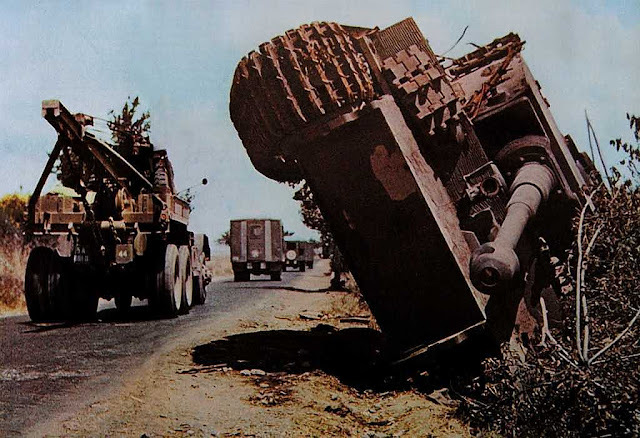 Their tank overturned after slipping off a narrow road in the dark, and when that happens, you either wait or start walking. 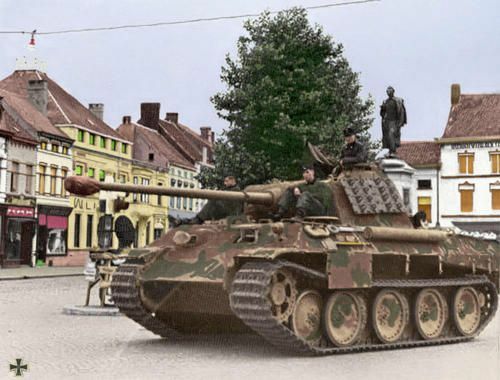 Panther tank of the 1st SS-Panzer-Division “Leibstandarte Adolf Hitler” in Eeklo, Belgium, June 1944. Panzer MK IV tanks knocked out by air attacks near Lanuvio, Italy, mid-1944. Men of the 26th Battalion, Queen's Royal Regiment (West Surrey), 169th Brigade, advance past a pair of burning German Panzer IV tanks in the Salerno area of Italy, September 1943. 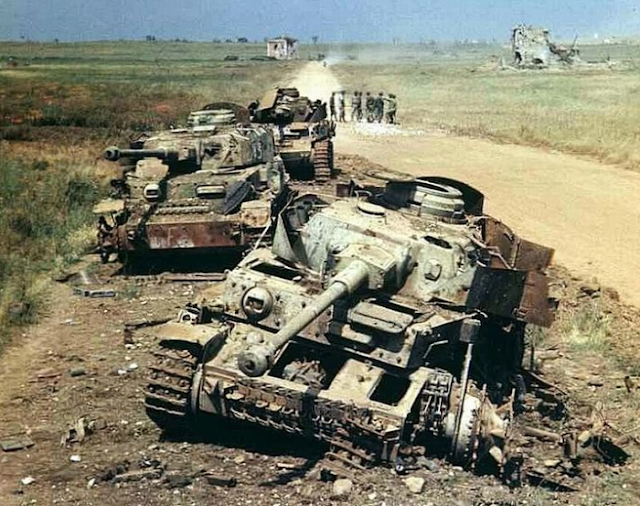 Looks like an effective ambush of a German tank column (colorized). 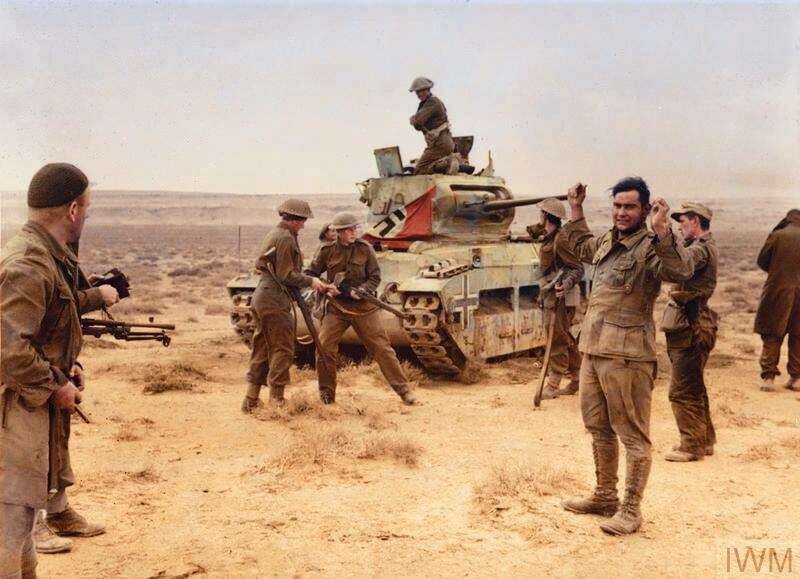 The crews of Churchill tanks. 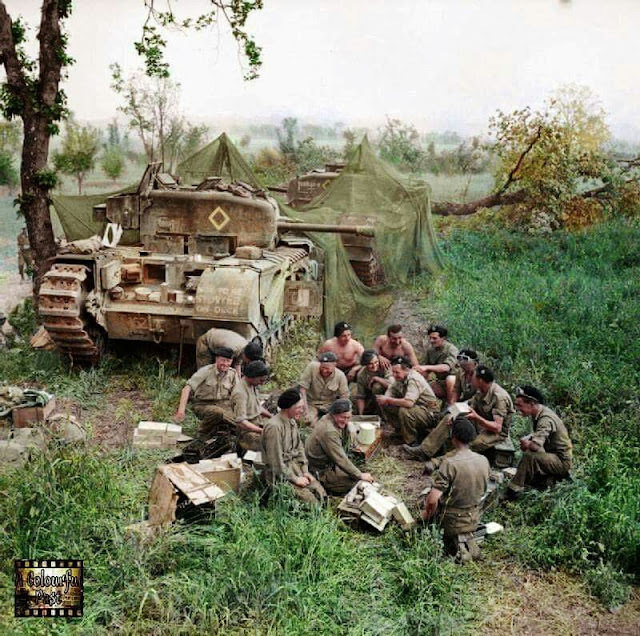 Churchill tank crews HQ Troop, 51st Royal Tank Regiment, 25th Tank Brigade, share out rations near their camouflaged vehicles before going into action in support of 1st Canadian Division, Italy. If you ever wonder why there are many pictures of this sort of gathering on the Allied side but few on the German side, it is because the Germans preferred to distribute war-like photos for propaganda purposes. The Allies were looking to soothe the hearts of the ladies behind the lines who were worried about their husbands, sons, and boyfriends. 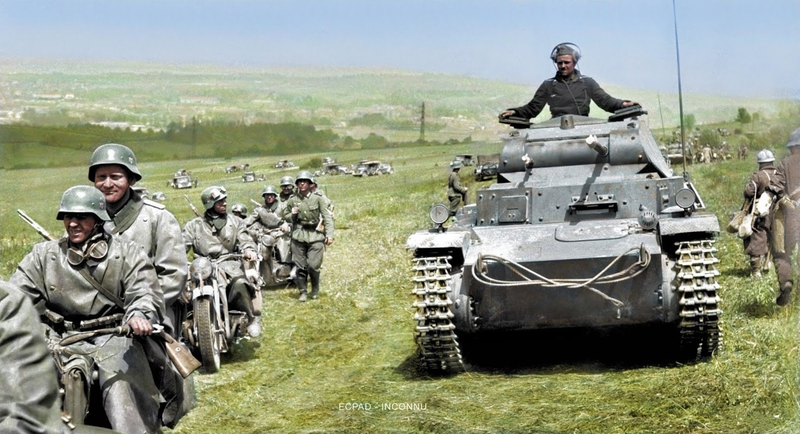 24th Panzer Division during Operation Barbarossa, Summer 1942 (colorized). 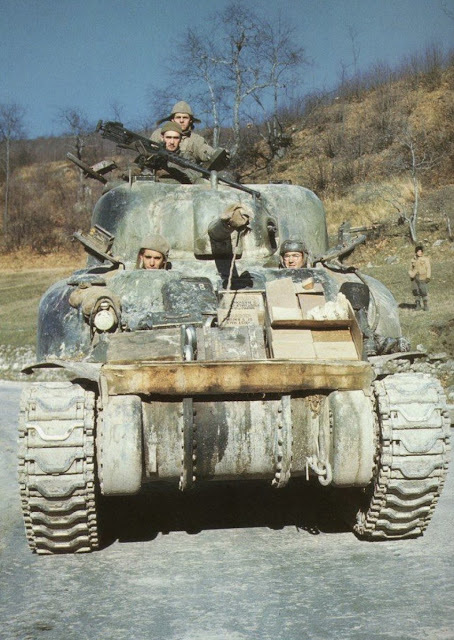 An M4A1 Sherman of 1st Armored Division on the road to Lucca, Italy (west of Florence) on the Gothic Line, 10 March 1945. The driver appears to be wearing glasses. 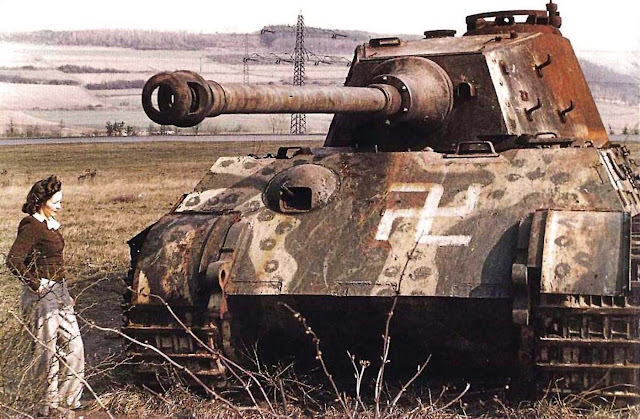 Long after the battle and perhaps the war, a King Tiger with “octopus” camouflage scheme sits silently in a field.